Less than a month ago I participated in another “Sign” challenge sponsored by Cee Photography. So I needed to come up with something new for this week’s Weekly Photo Challenge: Signs. Signs are everywhere so it didn’t take long. 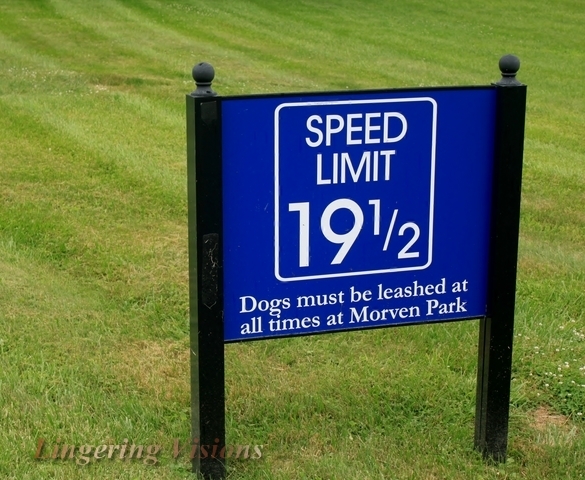 On Sunday I went with some friends to a place here in Virginia called Morven Park. Driving through the property we saw this sign. I knew immediately I had what I needed to complete the challenge! I thought this was so funny because rarely, if ever, do you see a posted speed that is not in increments of 5. Paul, our friend who drove said that 19 1/2 miles per hour was just right. He said that when he pushed it to 20 dust and gravel began to kick up. So this is was obviously researched. You have to admire the attention to detail. That’s crazy, funny, ridiculous, and ah crazy! That’s another nice way of putting it. Love it, love it, love it! I’m sharing the link on Facebook. Well thank you. Thank you VERY much. OMG that’s just too funny.